Jamie Purviance, author of Weber series, has created excellent shrimp recipes! 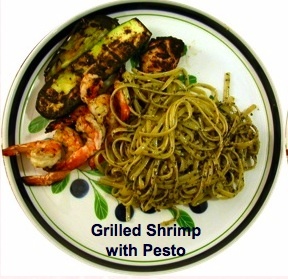 The shrimp should be Large, 26-30 per pound. Melt the butter in a large deep dish frying pan or iron skillet over low heat. When melted, raise the heat, and add the remaining ingredients except the shrimp. Cook, stirring often, until browned to a rich mahogany color, about 10 minutes. Add the shrimp, stirring and turning to coat well with the seasoned butter. Cook until the shrimp have turned a rich deep pink, about 10 minutes. Serve the shrimp in their shells, peeling them at the table. Melt butter or margarine in a medium pan. Place shrimp in a baking dish, pour melted butter over and stir to coat. Arrange shrimp in the baking dish in a single layer and sprinkle with Cajun seasoning. Bake in 400° F. oven for 20 minutes, or until shrimp is done. Serve over hot rice. 1. Melt a stick of the butter in a skillet. Saute the garlic, onions, celery, parsley, rosemary and seasoning blend for about 2 - 3 minutes. 2. Melt the rest of the butter. Add the beer. Add the sauteed stuff, Worcestershire and lemon juice. 3. Dip the shrimp in the seasoned butter. 4. Bake in a 350 degree oven until the shrimp turn pink, about 15 minutes. Serve in big bowls. Put in a handful of shrimp and ladle lots of the spicy butter sauce over it. Serve with plenty of French bread. Shell, devein, and rinse shrimp. Grind seasonings in mortar and pestle. In large skillet over high heat, melt butter, add garlic, seasonings, and worcestershire sauce. When bubbly, add shrimp. Cook 2 minutes, stirring and shaking the skillet. Add beer and cook 3 minutes. Remove shrimp and reduce sauce, adjusting seasoning. Serve shrimp over rice with sauce spooned over the top. 1. Shell, devein, and rinse shrimp. 2. Grind seasonings in mortar and pestle. 3. In large skillet over high heat, melt butter, add garlic, seasonings, and Worcestershire sauce. 4. When bubbly, add shrimp. Cook 2 minutes, stirring and shaking the skillet. 5. Add beer and cook 3 minutes. Remove shrimp and reduce sauce, adjusting seasoning. 6. Serve shrimp over rice with sauce spooned over the top. Spray a large skillet with non-stick cooking spray. Heat until hot. Add the shrimp and cook for 3 minutes, or until the shrimp are pink, stirring constantly. Spoon into a serving dish. Chill, covered, for 1 hour or longer. Garnish with lime wedges. In a small bowl, combine the lime juice, sugar and salt. Place oil in a 10- or 12-inch skillet, and turn the heat to high. A minute later, add the garlic and chili flakes and cook the garlic until it just begins to brown. Immediately add the lime juice mixture all at once, and cook until it reduces by half, or even more, 3 to 5 minutes. There should be only about 1/4 cup of liquid in the skillet, and it should be syrupy. Add the shrimp, and cook over high heat. The shrimp will give off liquid of their own and begin to turn pink almost immediately. After about 2 minutes, stir contents of pan. Continue cooking, stirring occasionally until all the shrimp are pink, about 4 minutes total. Taste, adjust seasoning, garnish with cilantro and serve with rice. 1. Dip shrimp individually into the batter and then roll in the coating. 3. Allow to drain on paper towel. Serve with various dips: ex. honey, soy sauce, Tabasco, honey-mustard, or marmalade-ginger. 1. Devein the Shrimp from the belly, leaving the shell on. 2. Heat the oil in a wok or wide heavy skillet. 3. When the oil is rippling, fry the shrimp and stir fry over high heat for 2 minutes. 5. Return 1/2 Tbs oil to the wok and reheat. Throw in the shrimp along with the ginger, garlic, and onions. 6. Stir fry for 20 seconds. Season with salt and freshly ground pepper. 7. Stir fry for an additional 20 seconds. Melt the butter and oil in a flame proof baking dish. Add the garlic, herbs, peppers, bay leaves, paprika, and lemon juice, and bring to a boil. Turn the heat down and simmer 10 minutes, stirring frequently. Remove the dish from the heat and let the flavors meld for at least 30 minutes. Preheat the oven to 450 F. Reheat the sauce, add the shrimp, and cook over medium heat until the shrimp just turn pink, then bake in the oven about 30 minutes more. Taste for seasoning, adding salt if necessary. 1. Combine all above ingredients except shrimp, set aside. 3. Pour sauce over shrimp and let stand at least 24 hours in refrigerator. When ready to serve, bake at 350 for 20 minutes, basting often. Place under broiler for a minute or two until tails turn brown. 1. Combine dressing, Worcestershire, garlic powder, pepper, and Tabasco. 2. Place Shrimp, Scallops, and onion in large container. 3. Pour marinade over all, making sure all is fully covered. Refrigerate at least 1 hour. Overnight if possible. 4. Thread Shrimp, Scallops, and onion onto skewers. Cover grill with foil, punched with several holes. 5. Cook with cover on until Shrimp and Scallops are cooked through. Turn occasionally and brush with marinade. Cayenne and black pepper give this dip a peppery kick. Just the thing to spice up an hors d' oeuvre platter of crunchy, fresh vegetables. Serving size: Makes 1 cup. Combine all ingredients and mix well. Refrigerate. Combine cream cheese and next 8 ingredients (cream cheese through hot sauce), stirring well with a whisk. Stir in yogurt. Add crabmeat and remaining ingredients; stir gently to combine. A quick and easy dish of shrimp sauteed in a spicy sauce of butter, garlic, Worcestershire sauce, red wine, and chipotle chiles. Serve over steamed rice. Heat a skillet over high heat with the oil. Add all the spices and the shrimp to the skillet. Mix in the tomato pickle and cook for 30 seconds or so, until the shrimp is cooked through. Add rice to the skillet. Garnish with shredded cilantro and mint. Slice the tomaotes, smear turmeric and salt on them and soak them in 1 cup vinegar.Leave for about 2 hours. Blend together the garlic, ginger, red chillies and 3/4 of the mustard, with a little vinegar. Heat the oil and add the remaining mustard. When the mustard crackles, add the fenugreek. Fry for 2 minutes and then add the blended mixture and fry well for over 20 minutes. Add the tomatoes and the remaining vinegar. Stir continuously as the mixture comes to a boil. When the pickle is almost done, the oil begins to float at the top. Take it off the heat and let it cool. Store in a clean bottle. 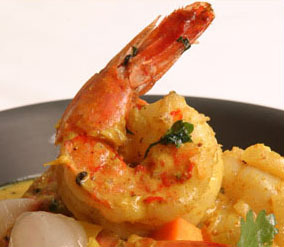 Make sauce: Place all ingredients except shrimp in a small bowl and stir until well-combined. Cover with plastic wrap and refrigerate until ready to serve. Place shrimp in a large colander; run under cold water until defrosted. Pat dry with paper towels, put in a bowl, cover and refrigerate for at least 30 minutes or up to 6 hours before serving. Arrange shrimp on a platter and serve with rémoulade. Blend all ingredients except shrimp. Allowing 4 or 5 shrimp for each appetizer, spoon onto crisp lettuce with sauce over all. Alki Point, one of the first settlements in Washington, was planned as a great meropolis called "New York". It never made the grade, so the early settlers tacked "Alki" - Chinook for "by and by" to its name. The "New York" was subsequently abandoned. This sauce was created somewhere near Alki Point (now within Seattle's limits) and it is a dream that does come true. Mince as fine as possible: 3 hard-boiled eggs, 3 green onions, 3 sprigs parsley, 1 clove garlic, 6 stuffed olives, and 1/4 of a green pepper. Mix this with 2 cups mayonnaise along with 2 tablespoons anchovy paste and 2 tablespoons tarragon vinegar. Taste and add salt, if necessary, and Tabasco to taste. Use as a shrimp dip or a sauce for any shellfish, including scallops or mussels, or for a fish salad.